I am passionate about teaching movement: movement that heals, strengthens and brings joy. Movement that connects you to your body, to your breath, to nature and to others. From a place of centered calm in our bodies and our minds, you can achieve anything. I draw from Pilates, Zhealth (a brain based fitness technology)*, Strength Training and Yoga to help you reach your goals. Train with me 1-on-1 or come along with me on one of my retreats or workshops to experience the transforming power of movement. Follow me on Instagram for daily inspiration to fuel your mind, body & soul. Included in the cost: Accommodations and 19% tax, 3 meals a day, all Yoga and Pilates classes. NOT included in the cost: Flight expenses, taxi, shuttle service to and from Mar de Jade, spa treatments, excursions or outside activities, gratuity, bar drinks. Early deposit of $600 is required by August 13th to reserve your space. Lila Heller (the creator of these retreats) is committed to creating Retreats that uplift, inspire and change lives. 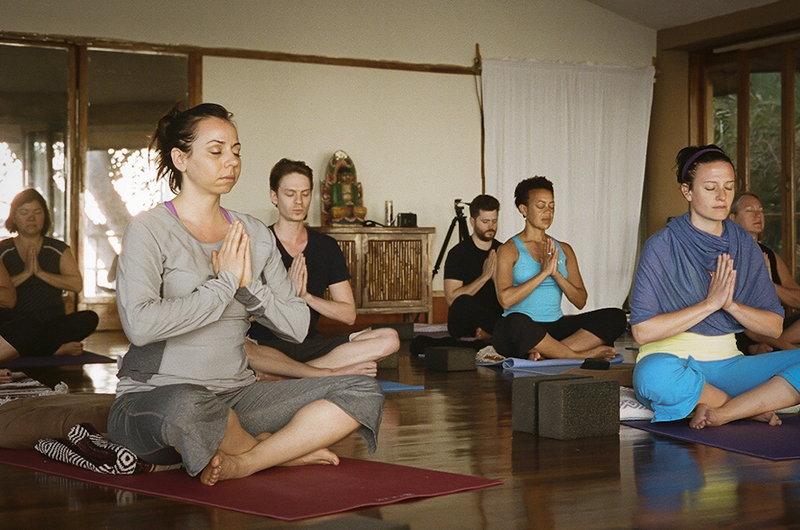 She has created this retreat with the intention of bridging the gap between Pilates and Yoga. Students will learn to integrate Pilates principles into their yoga practice in order to build strength, flexibility, and increase mind-body awareness. Sunset Yoga classes revitalize the spirit and deepen your connection to self and others. Three classes will be provided daily. Mornings will begin with a Pilates and brief seated meditation. Breakfast and mid morning Pilates will follow focusing on strength and waking up the center. Evening Vinyasa Yoga classes will unwind the body with restorative stretches and healing breath work. Meals: Three delicious meals are served daily and buffet style in Mar De Jade's breezy open-air pavilion overlooking Chacala Bay. All meals are well balanced, nutritious, and prepared with a mix of fresh local products and organic fruits and vegetables from their own farm. Be sure to let us know if you have any allergies or dietary restrictions as Mar De Jade is happy to accommodate vegans, vegetarians, gluten-free, and dairy free diets. Purified water is also provided for drinking. GROUNDS AND ACCOMMODATIONS: Mar De Jade is complete with yoga and meditation studios, dining rooms, bar, guest lounge, and reception. There is a full sized swimming pool, a wading pool, large Jacuzzi, and lounge areas for sunbathing. 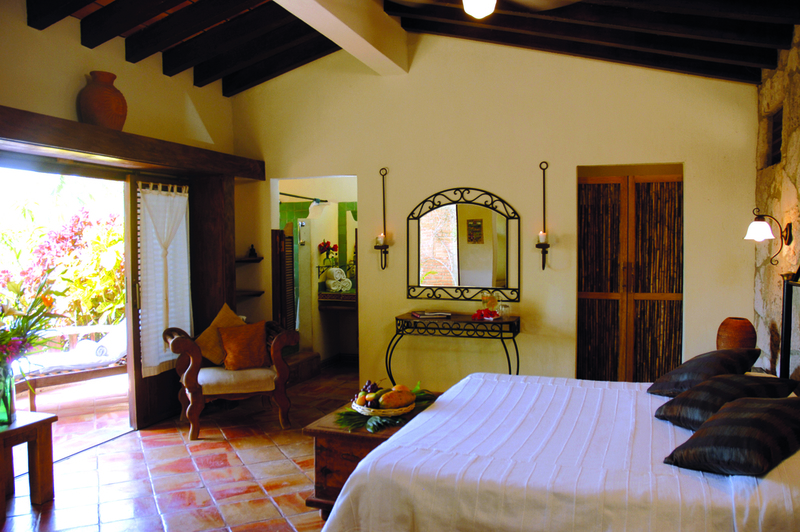 SPA: The fully equipped Spa "El Santurio" includes a large outdoor Jacuzzi, Cold Plunge, and Steam Room. Massage and spa treatments are available for additional costs. "I took new risks and discovered I was capable of much more than I imagined. At the end of the retreat I was more flexible than before in both mind and body. Through the week I gained a deeper understanding of the different principals of yoga and Pilates and how the two relate to each other." Newly remodeled in the last year! Single Suites: These beautiful suites with king beds are perfect for couples or singles, offering privacy and comfort with a terrace or balcony facing the ocean and gardens. Some are crafted in a Mexican style, with cantera rock, clay tiles, hand painted mosaics and finished with tropical mahogany woods. Others have an airy Mediterranean feel with floor-to-ceiling windows that allow plenty of natural lights and fresh breeze. All have bathrooms with bathtubs, some have an extra futon bed in a separate alcove. Double Suites: These spacious and comfortable suites have two double beds and a sitting area; they are ideal for families or for friends to share. They boast floor-to-ceiling windows that let in fresh air and sunlight and have private balconies that face the gardens and ocean. 1) A $600 deposit is due at time of enrollment. All costs include all classes, accommodations, and three meals a day. 2.) Registration form and deposit are required by August 27th in order to reserve your space. 3.) Payment is due in full by October 30, 2015. "Lila is a gifted teacher with a wonderful rapport with clients. She is fun to be with. Amanda who I did not know as well, also did a great job and her yoga sessions were demanding but rewarding. I would highly recommend this retreat to anyone who would like to spend a week on their personal physical and mental well-being. You will come away in better shape, both in body and mind, and will have had a tremendous amount of fun in the process. As well as some excellent cocktails." "My week at Mar de Jade was the first time I’ve ever taken a vacation truly for myself. As a mother of three small children, I was ready for a break, and the week was perfect in every way:location, food, classes, instructors, and the company of the other students. Mar de Jade is beautifully located on a wonderful bay, perfect for swimming in the waves or walking on the beach. The food was healthy and delicious. Lila and Amanda are incredibly supportive, happy, and fun instructors, ready to meet each individual wherever they are. I went Mar de Jade feeling tired and stressed, but I left feeling happy, centered, and eagerly awaiting the next retreat! March cannot come soon enough!" "The Pilates and yoga were perfect bookends to the day, filling us all with strength, mobility, and ease. The classes strike the right balance between being challenging yet also supportive. Lila and Amanda are skilled, generous, and kind teachers who empower each person to try their hardest and to open themselves to the experience of the retreat."